Its time to take a some serious news regardng the next generation iPhone, we are bit confused from couple of months regarding the iPhone 4S or iPhone 5 launch. 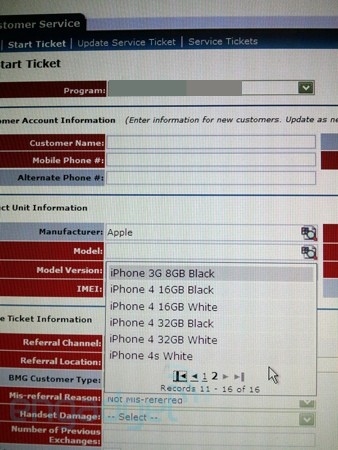 Let me add some fuel in the iPhone 4S model exisitence, Engadget reports that they have got information from an unknown tipster that an iPhone 4S model is popped up in the internal ticket system of AT&T this morning. While Apple is still rumored to launch two models of iPhone this fall, iPhone 4S and iPhone 5, this news makes a lot of disturbance around the sources who claimed to have look into iPhone 4S, while other was reporting that they have heard about the iPhone 5, in the last couple of weeks we have seen. Many carriers around the globe has start pointing their teams to know more about the iPhone 5, also some have spent a really big money in only the marketing of the phone. Be in touch with us, Apple is rumored to kick an event at the end of this month to announce new iPhone.